My inspiration for this challenge was a paper pad called Love Letters I found amongst my stash .... luckily all the papers were various shades of Pink and Green which made my life so much easier. 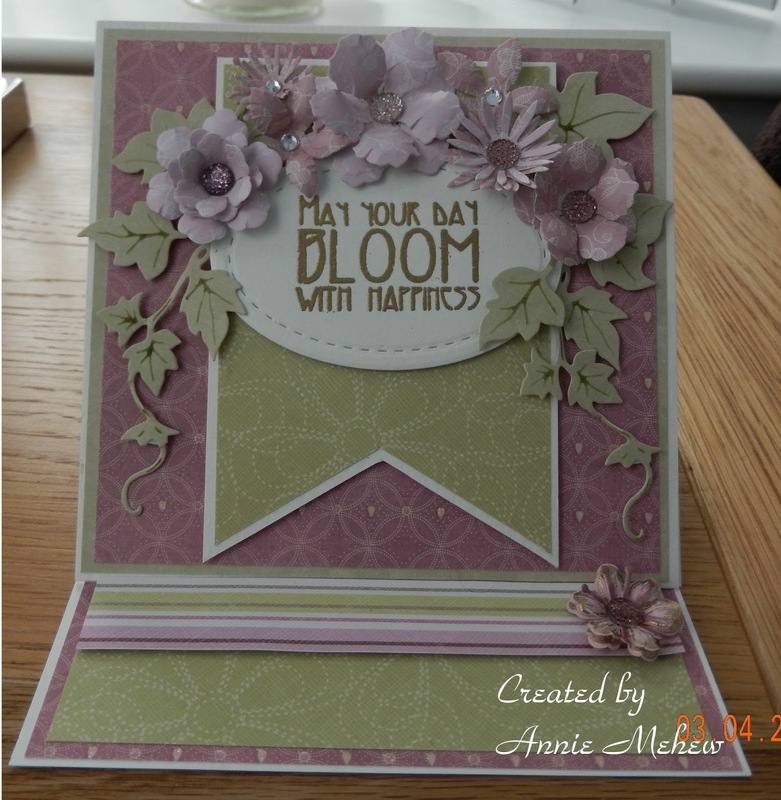 I decided on an easel card one of my favourite cards and so simple to make. I made the base of my easel from some lovely cream hammered card which holds it's shape beautifully, then I chose my papers and layered them up, I decided the top layer was to be banner shaped which I cut out freehand. I spent a lovely afternoon making my flowers and foliage, something I have always enjoyed doing so now all that was left to do was the sentiment, I searched through my stash and then I remembered the craft magazine I had bought which had many stamps in the style of Rennie Mackintosh as a freebie..... and there it was 'May your Day BLOOM with happiness ... perfect. The best thing about easel cards is that they fold down really flat for posting which is always something to think about. Hi there Annie! Oh my goodness this is SO VERY elegant and gorgeous...your DIL will be so very thrilled!!! 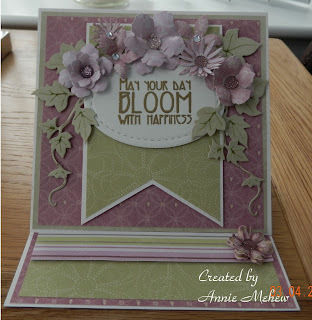 Your hand made flowers are stunning...a beautiful card my crafty friend! 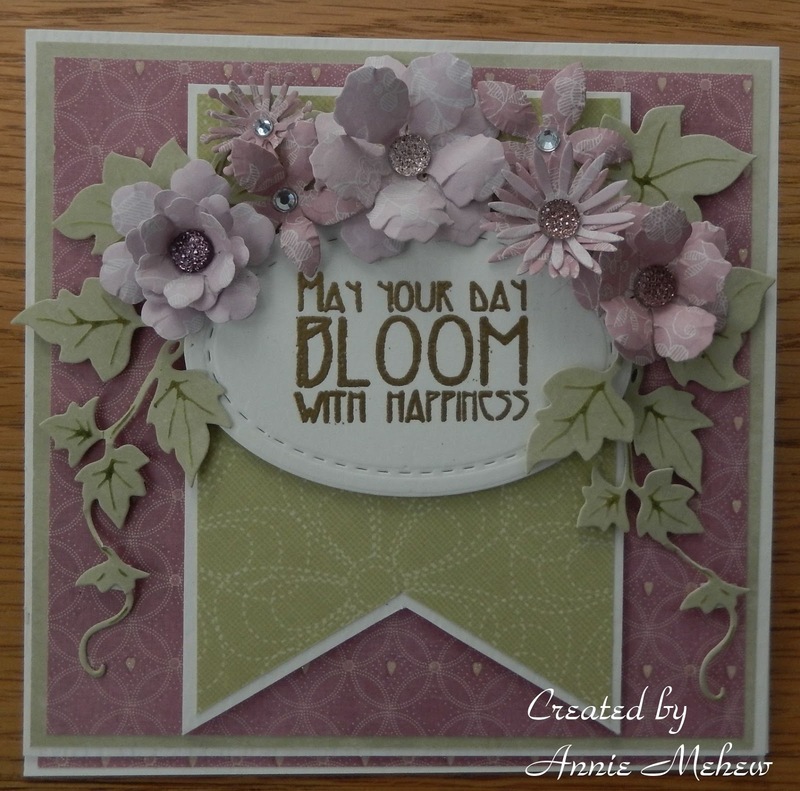 Hope you have a most wonderful weekend Annie! 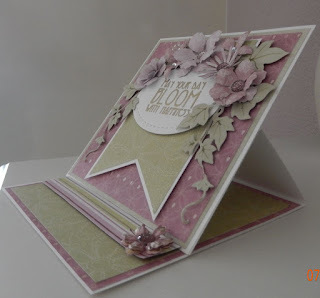 Gorgeous and elegant and the flowers are fabulous..so VERY pretty and I love the design of the card, too!! 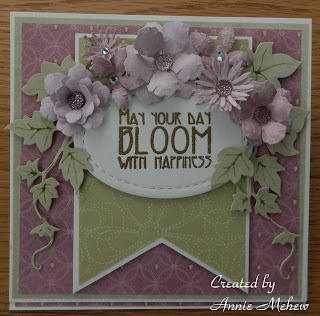 Annie, I just now run unto your blog and this BEAUTIFUL card!!! Your daughter-in-law will LOVE this beauty!!! Your flowers and foliage are GORGEOUS! What dies did you use to make them? Please let me know as I would like to try some!